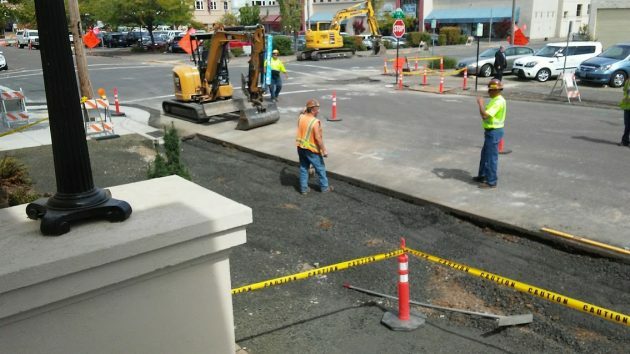 The downtown street reconstruction project is affecting not just the library but just about everything in the central part of town. Sidewalks and street corners are being ripped up and rebuilt just one or two blocks at a time, but with all the equipment, whether parked or in use; the hundreds of construction signs and traffic cones, plus the flaggers and detour markers — well you get the idea that the whole place is being turned upside down. The crews of contractor Emery & Sons, though, are taking pains to preserve public access through all the activity. 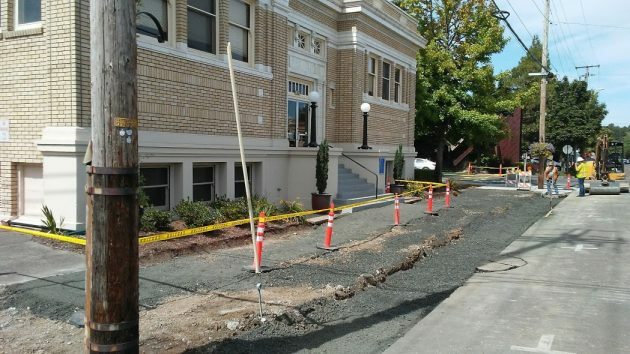 At the Carnegie Library, even though the sidewalk was gone, they had carefully used yellow tape to designate a route to the front steps. On-street parking in front of the library has temporarily disappeared, as it has in other downtown blocks. As a consequence, the city lot at Third and Ferry (I still call it the old PayLess lot, which it hasn’t been for something like 35 years) was jammed full on Wednesday. The $8 million streetscape project funded by CARA, the downtown urban renewal district, is intended to make the downtown business district more appealing to residents and visitors alike. This, the thinking goes, will help downtown businesses and thus increase the economic value of the downtown area. Eventually that’s supposed to yield more jobs for local residents and more property tax for local governments. The view from the downtown library’s front door on Wednesday. That’s all right Hasso, I still refer to the Old Sears Building and the Old Sears Parking Lot. Kind of like the old Rodney Dangerfield bit about getting directions ” you go down the street and turn where the old school used to be”.